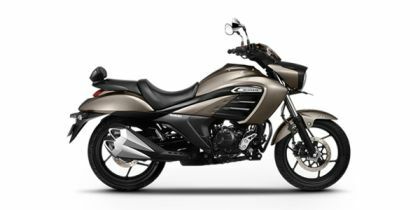 Suzuki Intruder price starts at Rs.To Be Announced (Ex-Showroom, Delhi). The Intruder 150 is powered by the same 154.9cc air-cooled petrol engine seen on the Gixxer 150 but in a slightly different tune. It produces 14.14PS at 8000 rpm and 14Nm at 6000rpm. The motor has a slightly different state of tune owing to a larger air intake, airbox and tuned exhaust. It is mated to a 5-speed manual gearbox borrowed from the Gixxer but with a larger rear sprocket for low-end performance. It has a fuel tank of 11 litres and weighs about 148kg, 8kg more than the Gixxer. Braking is done by disc brakes fitted at both ends. Q. Is there any luggage space(at least 2 bags) carrying option for long ride? Q. Since this bike is self start only, what if there is battery issues? Is kick start option not available in it? Q. Hi sir, my self Samuel , I am from Hyderabad , Does Suzuki intruder cruiser Have ABS system braking system. Yes, Suzuki Intruder gets Single Channel ABS in all variants.